Use DivorceWriter to complete your own Illinois divorce forms. You'll receive all the documents you need to get a divorce in Illinois, ready-to-file, with complete step-by-step instructions on e-filing. Division of property, debts, alimony, name change, and minor children (including parenting time, Illinois child support calculations, and more) are covered in the DivorceWriter interview and documents. E-filing is mandatory in all Illinois counties. DivorceWriter provides detailed, step-by-step instructions for e-filing using eFileIL including registering for an account and uploading documents for filing. There's no longer any need for multiple copies or a stressful, time-consuming visit to the Court Clerk's office. To file for divorce in Illinois, at least one spouse must be a resident of the state (or stationed in-state while a member of the armed services) for at least 90 days before filing. While Illinois has several fault grounds for divorce, the vast majority of divorces in the state are filed on no-fault grounds. If you and your spouse have "irreconcilable differences" that have permanently damaged your marriage, you have met the grounds for no-fault divorce in Illinois. Uncontested divorces in Illinois are usually finalized 30-60 days after filing. Illinois has two divorce options, simplified and standard. Everyone is eligible for a standard divorce, but you have to qualify for a simplified divorce. The cost and time to complete both types are the same. 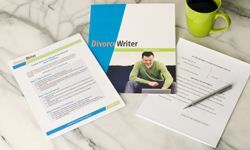 DivorceWriter makes it easy to choose the right divorce type for you, and if you change your mind at any point, you can switch your paperwork at no additional charge. As of July 1, 2017, however, the flat percentage has been replaced by the income shares model that is far more common nationwide. Under the income shares model, each parent is assessed his or her proportionate share of the basic child support obligation based on income. The income shares model has the advantage of taking additional expenses into account as well as the amount of parenting time each parent spends with the children. If you and your spouse have agreed to a higher or lower child support amount than the amount calculated under the Illinois Child Support Guidelines, the DivorceWriter interview makes it easy to select a different amount. You have qualified to use DivorceWriter to complete your Illinois divorce papers online. Select "Continue" to start the interview.